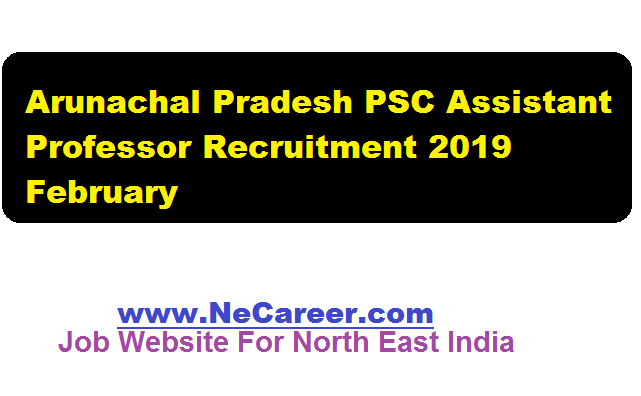 Arunachal Pradesh PSC Assistant Professor Recruitment 2019 February :- Hello dear job aspirants. Welcome back to North East India's No. 1 Job Portal NeCareer.com . We are back with Arunachal Pradesh jobs 2019. Arunachal Pradesh Public Service Commission has issued a job notification recently for Assistant Professor posts. Online applications are invited from citizens of India for filling up of 25 (twenty-five) posts of Assistant Professor under Rashtriya Uchchatar Sikhsha Abhiyan. The details of the vacancy is mentioned below. Age:Candidates appearing for post of Assistant Professor must not be above 37 years of age as on 72-03-2079. However, the upper age limit is relaxable by 5 years for APST and another 5 years for Arunachal Pradesh Govt. employees. Interested and eligible Candidates are required to apply online only through Website www.appsconline.in. Brief instruction for filling up online application is available on the above mentioned Website. (Please read carefully all the instructions before filling up online application).